Climate change threatens to reshape the disasters we face. 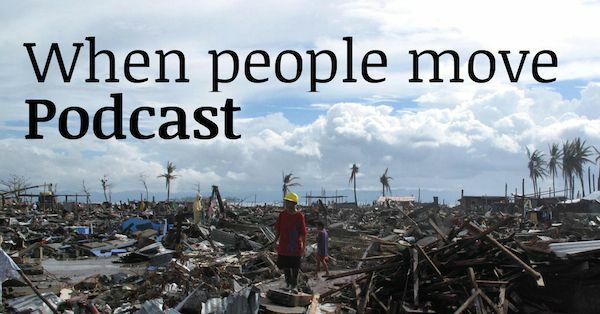 The podcast takes the listener to a range of different locations and to different types of disasters: from Typhoon Haiyan in 2013 which ended up displacing 4 million people, to the Horn of Africa where people still live in refugee camps after the year-long drought in the region in 2011. Over the last two years, the UK Climate Change and Migration Coalition has collected testimonies from people who have moved as a result of climate-linked disasters. By exploring these stories we can begin to answer questions about how climate change is creating new patterns of migration and displacement. We can also begin to ask how life on a hotter planet might mean in terms of living with new kinds of disasters, and coping with the displacement they create. This podcast uses testimonies from Pakistan, the Philippines, Somalia and Mexico. 1. Typhoon Haiyan/Yolanda made landfall in the Philippines on the 8th of November. It had been identified as one of the most powerful typhoons ever recorded only hours before. In a few hours it had killed 6,000 people and injured nearly 30,000. The typhoon displaced 4 million. By 9th November, the storm had moved into Vietnam and China. COIN (Climate Outreach and Information Network) is a ‘think and do’ tank focused on connecting people to climate change and climate change to people. COIN will change their name to Climate Outreach as of September 2015. Cover Images: Henry Donati/Department for International Development Creative Commons (CC BY 2.0) and Russell Watkins / Department for International Development.